I’ve always been something of a Valentine’s Day Scrooge – “Humbug!” Always, even in fifth grade, while trying to decipher the nuances of the text on candy kisses enclosed in the envelopes during the school Valentine swap. I’m not doctrinaire about it. I always bring Mary a card and some little treat. And it is marvelous to stop to be mindful of the love and friendships we enjoy. I’m just not a fan of Hallmark holidays. It’s hard not to be a bit cynical when the hearts come out the last week of December, during the Christmas closeout sales. Much of that cynicism ended two years ago, on Saturday, February 14, 2009, at noon. Mary had spent the morning at Saint Francis Episcopal church. Like their namesake, the good people there have a serious ministry with animals. They rescue dogs and train them as companion and service animals for vets coming home from our wars. 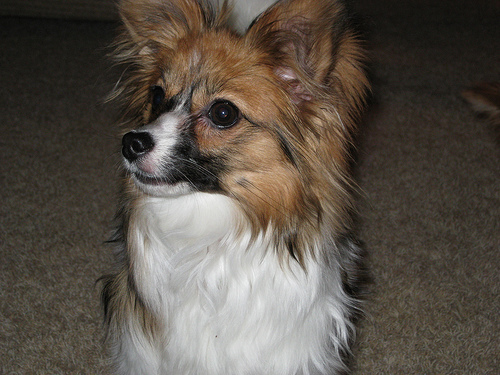 Mary called to tell me an eight month old papillon had washed out of the program. The little thing been mistreated or neglected, for she was much too hyper and skittish to make any kind of service training feasible. “She is really sweet,” Mary said. My wife later confessed that she was counting on me to be the voice of reason, and tell her to get real. Didn’t happen! Instead, I leashed up our other two dogs and took them over to meet Missy. It was instant bonding, all around. Humans and canines instantly warmed up to the little one, and she to us. Thankfully, neither Mary nor I had any clue how much harder three dogs are to care for than two! Missy was part of the family and we took her home within the hour. Now Valentine’s day will forever have a face, one far more appealing than any stupid, rosy-cheeked cupid. The hearts of people and animals do not seem to have any limits for how much love they can hold. At this very moment I’m gazing at Missy curled up at my feet – one of the biggest hearts in one of the smallest beings I have ever had the joy of including in my life. This entry was posted in Animals, Holidays and Festivals and tagged Animals, Dogs, holidays, postaweek2011. Bookmark the permalink. Awww! Happy Missy Day to you, Morgan. I don’t know – I’ll have to hunt around for one.